For the 25th anniversary of Final Fantasy, Square Enix decided to let the series follow the beat of a different drummer and created Theatrhythm Final Fantasy, a celebration of the series’ characters and outstanding music. I enjoyed that game two years ago, and now the team that made the first stand-alone rhythm game in Final Fantasy history returns for an encore with Theathrythm Final Fantasy: Curtain Call. While the first game was great, there was still room for improvement, so did indieszero and Square Enix tweak things for better or for worse? At it’s core, Curtain Call is the same as the original: You select a party of four heroes that span the history of the franchise and set out on an adventure. There are three types of stages: field music stages, where your party wanders about to various town and world map tunes from the series; battle music stages, where your party engages adorable puppet-like versions of enemies (Did you know that malboro could be cute? Me either.) while tapping out rhythms to battle themes; and event music stages, where game footage rolls in the background while you drum out songs from major moments in the various titles. At the end of each stage, you receive a grade, from F to SSS (which no longer requires playing in stoic mode to achieve), rhythmia (which unlocks new stages, modes and options), items and experience points. 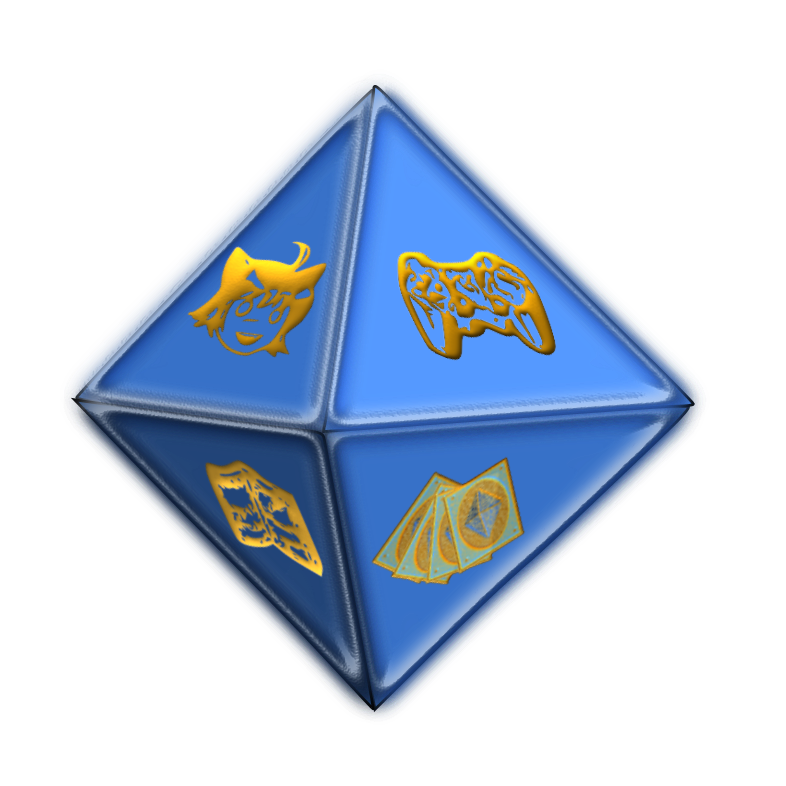 As your characters level up, they gain HP (to keep you alive longer if you mess up a song) and other stats, and learn skills and abilities which help when fighting in battle mode or exploring in field mode. While the game still primarily relies on your rhythmic abilities to be successful, these boosts can help keep you alive if you find yourself struggling with the harder songs, which is fortunate since some of the Ultimate level songs feel harder than they were in the first game. While Curtain Call follows the same basic formula, Square Enix has certainly changed some things for the better. For one, the Chaos Shrine/Dark Note system has become “Quest Medley,” instead. Like its predecessor, these are still randomly-generated collections of songs, but instead of just playing a few songs back-to-back and being done with it, Quest Medley has you travel between places on a map with your team, encountering locked doors and minibosses along with the songs you play. The HP you lose along the way is also carried over between songs in this mode, but in return, as you progress you get an experience multiplier, making it ideal for leveling characters. These quests are also much longer, and offer a save and return feature, making it much more friendly for on-the-go gaming. 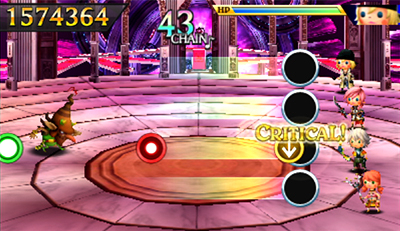 This version also offers a Versus Mode, where your party can challenge other players online or locally. Since the game just came out, I didn’t have a lot of luck finding people to play against online, but for the little bit of time I did play Versus, it seemed to work great. If you’re having trouble finding others to play against, you can battle against AI teams, as well. 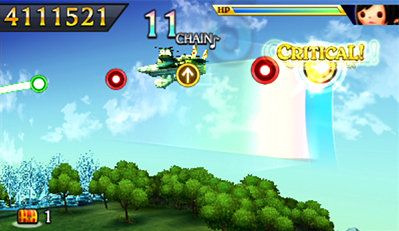 Since this is a battle mode, the only songs you can choose are, unsurprisingly, battle music stages, but with a twist: As you play the song, you and your opponent build up towards EX Bursts which alter the game in a number of ways, such as changing the scrolling speed of the icons, hiding what they are until the last second, etc. The effect is chosen randomly, which means that you might HP swap with your opponent and find yourself on the brink of death, when you had full HP before. Square Enix wanted to implement something a little different in this mode, but it’s really just an added annoyance that takes away from the game’s core mechanic. You can play without EX Bursts on the Ultimate level (hardest) scores, but not at a lower level. The fact that you can’t turn them off at lower difficulties feels like a big oversight, since lower-skilled players don’t need the added distractions that EX Bursts cause. Curtain Call also adds several new input methods. While the first Theathrythm required the use of the stylus for all tapping, swiping and holding commands, this new iteration added the ability to play using the analog stick and A/B/X/Y buttons, as well. There are three variations on these controls: A standard “button” mode using A, B, X or Y to tap out the touch notes while holding the button for sustained notes and the analog stick for the directional swipe notes; A “one-handed” button mode where the L button is used in lieu of A/B/X/Y (which is great in terms of accessibility options); and a “hybrid” mode where you can use a stylus in one hand and press buttons with the other (probably only useful if you happen to be Ultros). You don’t have to select one of these modes when choosing your song; the game detects what type of input you are using and files it away under that type once the song is over, so if you want to experiment with one control scheme but don’t like it, you can switch without quitting the song. Personally, I found the button modes were not accurate enough for following the sustained notes in the field music stages, as the analog stick doesn’t react as smoothly as a stylus when chasing sustained notes up and down the screen. However, it soon became my preferred input method during battle stages, since everything is linear. Of course, this is a rhythm game, so the most important thing about it is the soundtrack, and Curtain Call delivers in spades. It has well over 200 songs, roughly tripling the amount available in the first game, and almost every song from the first title is available in this one, including DLC songs. The song roster has expanded to include all 14 main series titles, plus sequels like X-2 and Crisis Core. It even includes songs from Mystic Quest, Tactics, Type-0, and Chocobo’s Dungeon. Of course, with as many songs as have existed in the Final Fantasy universe, some of them are bound to be missing, but this is a pretty comprehensive list of great songs, with a number of DLC releases slated down the line. The game also offers a plethora of different sound effects that you can unlock as the “chime” that plays when you hit a note, so if you get sick of the default sound effects, you have complete control over changing them. 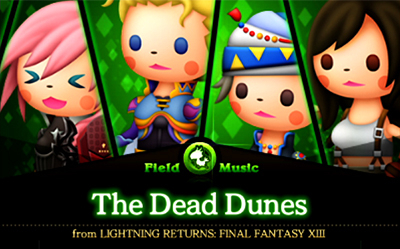 The unique and adorable graphics return from the first Theatrhythm. Caricatures of heroes, villains and monsters from throughout the universe show up in each of the levels, along with some fantastic backgrounds. The only downside is that you will be spending so much time watching the notes on-screen that you can’t really take the time to appreciate them. If only there were some sort of replay mode so you could enjoy your triumph over a song and enjoy the graphics for a while. The demo mode serves some of this purpose, but it would be nice to review your own performance not just the AI’s perfect run. There is also a theater mode for watching the event music movies, but not the regular stages, and a music player for the songs in the game, but it doesn’t show graphics with them. Overall, Square Enix did just about everything right with this sequel; they took what everyone loved about the first game and ran with it. They expanded some of the gameplay options, which, while not perfect, offer more variety than the first one. If you weren’t a fan of the first game, you probably won’t like this one either, but if you even remotely liked the original Theatrhythm, this one will be money well-spent.